"We are not revolutionaries by profession any morethan anybody else. We are thirsty and hungry for peace.We are forced to use these methods simply because Greeceand Serbia do not allow us to use other methods in order todefend our human rights and nationality. We will cease tofight as revolutionaries as soon as we are given the possibilityof fighting as citizens." Born March 4, 1881, in the village of Novo-Selo near Shtip, as the eldest and only son of seven children of Alexander Orushoff and Maria Alexandrova. After graduating from the Bulgarian Pedagogical school in Skopje (1897) he becomes a teacher and is enlisted into the ranks of IMRO. 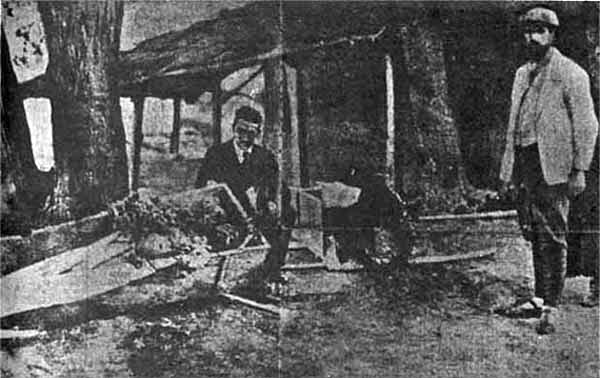 The Turkish authorities arrest him in 1903, and jail him in Kourshoumli-Han, the Turkish prison in Skopje. After 13 months a general amnesty gives him freedom and he resumes his work, becoming IMRO secretary for the district of Shtip. 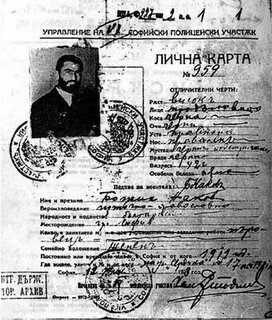 In 1905 ill-health prompts him to leave and go to Bulgaria. 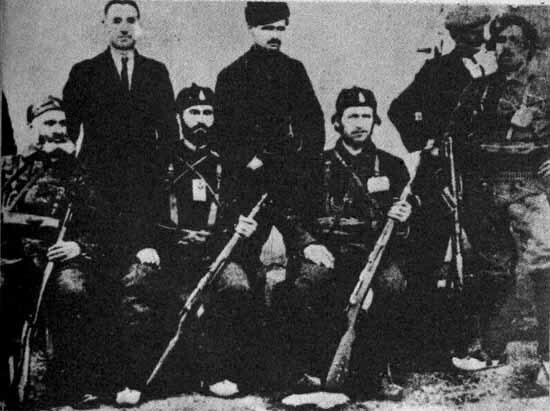 The murder of Sarafov and Garvanov in 1907, by Yane Sandanski's men, causes his return to help Hristo Matov stabilise the organization. He is soon elected to the office of rayon voyvoda (district chief). 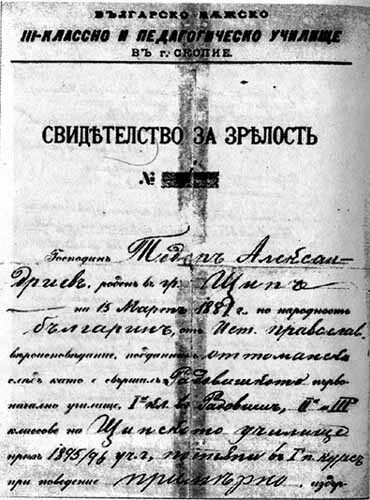 During the Young Turk revolution of 1908 he argues strongly against disbanding IMRO until the necessary guarantees for the rights of the Bulgarians and other Christians in Macedonia have been secured. By 1910 he is once again fighting the violent ottomanizing policies of the Young-Turks. Alexandroff is now voyvoda (leader) of the Kukush and Saloniki districts and in 1911 is elected to the Central Committee where he assumes a dynamic leadership role. 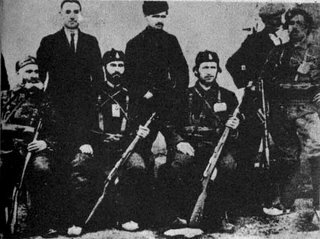 IMRO plays a major part in the First Balkan War, organising a detachment of 15,000 men comprising mainly Macedonian emigrants in Bulgaria. 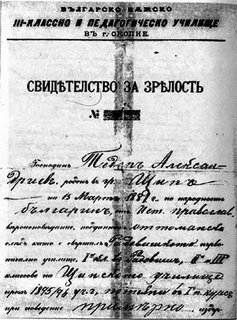 In the aftermath of the Second Balkan War and the harsh assimilatory policies of Serbia in Macedonia, IMRO strongly pressures the Bulgarian government and in October 1915 Bulgaria attacks Serbia and joins the Teutonic Alliance. WWI however, effectively destroys IMRO's capacity as a fighting force. Alexandroff, almost alone, rebuilds IMRO to its past formidable role. 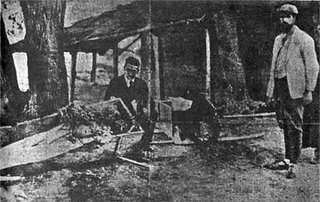 Because of these activities he is arrested and imprisoned in Sofia (1919), by the Stamboliski government, but manages to escape. Fleeing to the interior of Macedonia he conducts a relentless and fearsome campaign against the Serbians and Greeks. 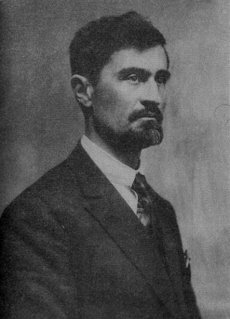 Todor Alexandroff, assassinated on August 31, 1924, was survived by a wife ("Vangelia"), son (Alexander) and daughter (Maria), who is still alive today and a strong proponent of her father's ideals and IMRO's charter.